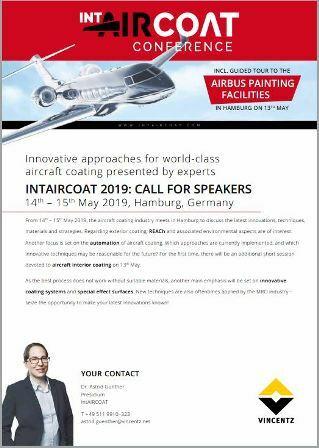 IntAIRCOAT 2019: Save the Date & Call for Speakers! From 14-15 May 2019, the aircraft coating industry meets in Hamburg to discuss the latest innovations, techniques, materials and strategies. For the first time there will also be a session devoted to aircraft interior coating. Further topics relate to the still hot topic REACh and associated environmental aspects. Another focus is set on automation of aircraft coating industry. Which approaches are currently implemented and which innovative techniques may be reasonable for the future? New techniques are also oftentimes applied by the MRO industry – use the chance to inform about your latest changes and innovations! The best process does not work without the appropriate material, hence another focus of the conference will be set on innovative coating systems and special effect surfaces.